This book is one of my most prized possessions. Namely because I got it at a car boot for £1 and far more importantly because it was signed in person by Marguerite Patten her very self when I met her at the Imperial War Museum last year. 94 years old she may be, but she is as bright as a button and sharp as a pin. I feel this nation owes her a great deal as she worked tirelessly with The Ministry of Food to produce (mostly) palatable recipes from the rations we had at our disposal. I have made quite a few things from this book, which is filled with top ideas and easy to follow instructions, not to mention a plethora of interesting adverts from the time. Some of these things have been utterly nom-some. Some things have been utterly bin-some. The below, you shall be pleased to hear, is the former. I have doubled the original recipe - mainly because I loathe grating carrot's but I invariably always do too many. But if I am honest with you, they are so yummy I always feel the need to over make. I also add extra baking powder to give them a little more oomph, and call them scones as opposed to their original "cookies" - purely based on the way they come out. Let the butter (or marg) sit out so that it is nice and soft and be creamed together with the sugar. Add the carrot in stages. It will look a little like vomit (nice eh?) at this stage and you may be thinking "This is rank!" - but stick with it. Also add the vanilla extract at this point. I usually add about 6 drops. Next add the flour & baking powder - again in stages. It shall start to look a lot more like a proper mixture the more you work it. As you mix, the carrots will release some of their moisture which shall bind the mixture together. It shall begin to look like a recognisable dough soon enough and it can be easier to mix by hand. Make sure all the flour is mixed in thoroughly. Brake off into pieces, roll in your palm and squish down a little bit. Sprinkle a little more sugar on top. Pop them on baking tray and, according to the recipe "...bake in a brisk over for 20 minutes". Or in modern day speak Gas Mark 6 / 200°C. Depending on your oven - bake less if you have a fan assisted - keep an eye on them. When they are brownish on top, they should be done. Leave to cool completely and serve with jam or burn your fingers opening them and plop some more butter on top. Because there is no egg to bind them, they can be a little crumbly, but this does not detract from their yum-ness. They can also be frozen. I am in deep envy about you meeting the original-and-best food writer. Green, absolutely green with envy about the book signing. In her post war book she discusses how people who were children in rationing years didn't like very eggy/creamy cakes and desserts when they became available, as they were used to the lighter taste of ration-book-baking. Fascinating! I suppose whatever guise childhood treats take, that's what you think of as nice forever! Perdita - thanks! Yes - I agree on the childhood thing - its why my Dad still loves things like Smash and beans. Eugh. Ok I'm sold, they sound and look Yum! Yum! 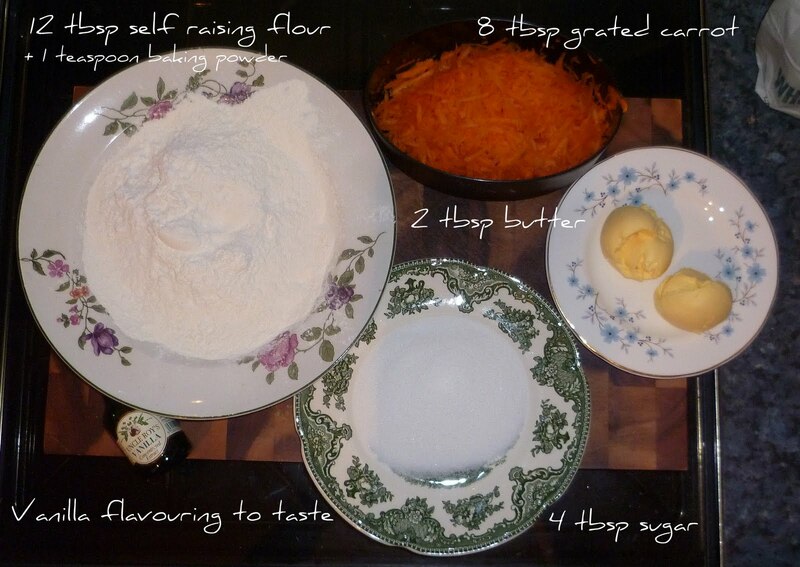 carrot is fantastic as a baking ingredient! That book looks wonderful,darl.Any other gems to share? These look great, and made with non-dairy margarine will also be perfect for my vegan friend! Have that book but have never tried that recipe, they sound and look yummy! I am also supremely jealous that you got to meet her holiness Marguerite Patten I love her and all of her books she's certainly a national treasure! You met St Marguerite! You jammy girl, I got the book for a Mother's Day present last year, completely love it and am defintiely going to try these now. Your pictures have helped becasue as the book has none I've been a bit timid in making things. "A brisk oven".. love it! The Wartime Kitchen & Garden is brilliant too, I picked that up for a £1 yonks ago and it has some great pictures. Thanks for sharing, will give these a whirl. These look yummy! I have this book too, and I love cooking from it with my daughter, as the recipes are so basic and forthright that she can understand them easily.